My role is help create a community within our buildings. I do that through a series of activities, events and outings - getting people together so they start to build relationships. Once you build relationships you start to build a community because you care about the people sharing your space. How would you describe the sense of community at TCQ? We discussed this recently at a meeting. I said that what I'm trying to do in some ways is to is create the community that our residents grew up in - one where you know your neighbours, know things about each other and look out for each other. I'm starting to put together a ‘skill base’ so that residents can offer out their skills to other residents - when they were young they would have known that if there was a burst pipe there was a plumber two doors down. So, to me, community is about caring for the people that you live with, being respectful and looking out for each other. What difference have you seen in people coming from their own homes to living at TCQ as they have settled? So many people have said to me, "It's the best decision I have ever made!" It's not an easy one leaving your home. Sometimes if you're on your own, you're leaving a house where you were with your partner and that's saying goodbye to a lot of things. But they have said, "I'm busier now than I have ever been. I can't believe the friendships I've made." Making friendships is important - I think lots of people get to a certain stage in their life and think they probably won't make any more new friends, they will just lose people. Last night's quiz was a great example. We didn't have to worry about putting people in teams, because most people already felt they knew someone and joined them or welcomed new people automatically. It's an amazing thing and I absolutely love it when I hear someone say, "I'm going to go out and get Mrs Smith's shopping this morning because I've heard she isn't very well." That's small but it's immense, isn't it? The whole thing. I love it! I love seeing those things. I'm quite a sociable person so doing something like the quiz last night is really fun for me. And people come to me and tell me, "Oh that was so much fun!" Regardless of your age you are a person. I had a friend who told me, “The minute I let my hair go grey I became invisible.” I think that many older people do feel invisible and I don't think that they are invisible here at all. How would you describe TCQ to someone who had never heard of it? I would say we are part of a charity and provide independent living for older people plus a nursing home. We have vast areas of communal space and that it's an open community. We're hoping that the local community from outside come in and we join the outside community. I think it's the whole intergenerational, inter-community thing that makes the difference. We're not a gated community. 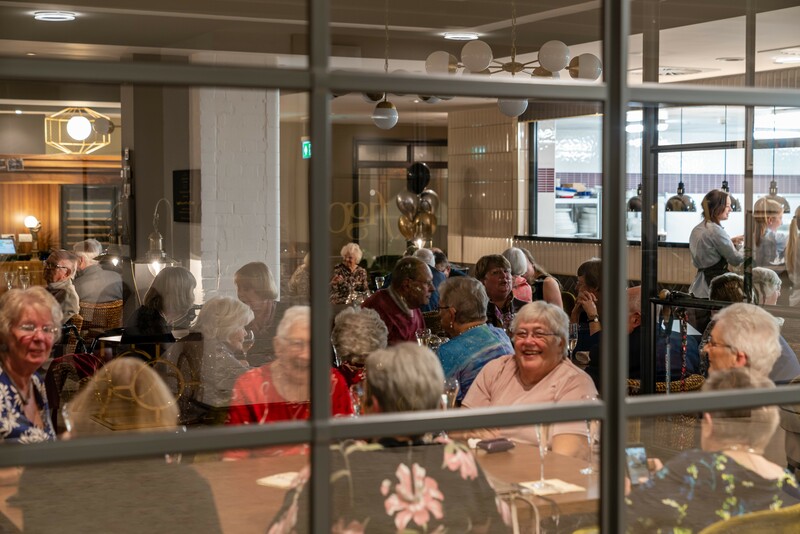 Our residents, even if they don't feel like being particularly sociable that day, can wander down into one of our public restaurants and be surrounded by everyday life - mothers and babies, people on their lunch break from work, all walks of life enter this place. They are not shielded from that and that makes a huge difference. You know so many people were so upset when the factory closed - at its height it had 6000 people working here. I think how this place has evolved into what it is now is such a positive thing for Keynsham. I've seen parents come in with their children, for swimming in the pool or for a pizza in B Block, and say, "Be careful you don't knock into any of the older people that live here." To me that's great, it means we're sharing the same space. For more information on The Chocolate Quarter in Keynsham, including about our monthly tours, show home opening times and properties available now, visit our dedicated retirement village page.